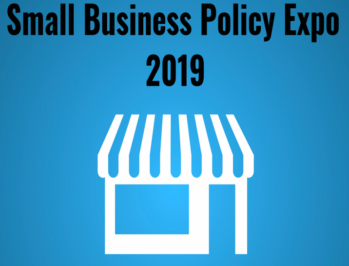 Washington D.C – The Small Business and Entrepreneurship Council (SBE Council) hosted a Small Business Policy Expo on January 30th featuring conversations with the nation’s leading small business advocates, entrepreneurs and policy experts. Panelists and attendees discussed the state of entrepreneurship and small business, including the pressing issues impacting both today. Among the panelists were representatives of U.S. Black Chambers Inc., National Association for the Self-Employed, the National Small Business Association, U.S. Hispanic Chamber of Commerce, International Franchise Association, National Association of Manufacturers, Associated Builders and Contractors, U.S. Chamber of Commerce, Future Forward and many more. The Small Business Roundtable co-sponsored the event, and Ramon Ray, founder & CEO of Smart Hustle magazine was the emcee. Participants at the event identified significant areas of potential bipartisan collaboration to further improve the environment for small businesses. “For his State of the Union speech and priorities for the economy, President Trump needs to look no further than the issues highlighted at Small Business Policy Expo 2019. The issues of concern for our job-creating, entrepreneurial sector of the economy are issues that have bipartisan support in Congress. We are hopeful that the Administration will build bridges with new Members of Congress and re-engage the relationships on both sides of the aisle to address the top concerns of entrepreneurs, such as the cost of health coverage, access to capital, tax simplification, workforce development, access to global markets, and encouraging more startup activity. There were many bipartisan gains for small businesses in the last Congress, and there is an opportunity for more progress in 2019,” said SBE Council president & CEO Karen Kerrigan. Leading advocates spoke about bipartisan consensus on these key issues, plus others such as regulatory reform, government procurement, immigration policy, an infrastructure package and more. Conversation also centered around emerging issues, such as data privacy regulation, and the need for Congress to advance a legislative package (given the accelerated pace of activity in the states) to establish one set of federal privacy rules to ensure the growth of the digital economy. A full list of the policy topics and each of the participants can be found here. Brian Blase, Assistant to the President for Economic Policy, National Economic Council, updated attendees on the Administration’s healthcare policies aimed at supporting small businesses, including Association Healthcare Plans (AHPs) and forthcoming rules on Health Reimbursement Accounts (HRAs). AHPs allow small businesses to band together and purchase coverage as a group, which reduce costs and increase choices. SBE Council has supported these initiatives, including changes to short-term limited duration health plans. When asked by a small business owner about the HIT, Mr. Blase said the Administration supports the two-year delay, as well as fixing many of the taxes in the Affordable Care Act. The event concluded with a special address from Rep. Steve Chabot (R-OH), Ranking Member on the House Small Business Committee, who discussed the importance of bipartisan efforts in Congress to help the small business community. For example, Ranking Member Chabot along with House Small Business Committee Chairwoman Nydia Velázquez (D-NY) have re-introduced the “Small Business Tax Simplification Act” in the 116th Congress, which is a widely supported bill among many small business organizations. Congressman Chabot has served on the House Small Business Committee since first being elected to Congress in 1994, and is the former Chairman. All participants agreed that it is crucial for small business owners and organizations to join forces to strengthen their influence and create a more powerful voice to let Congress know what they need. Small business owners and entrepreneurs are not asking for special treatment, but a level playing field and for government to remove barriers to growth and entrepreneurship. In SBE Council’s “2019 Policy Agenda for Entrepreneurs and Small Business,” a wide range of issues are covered to enhance small business competitiveness and to help revitalize the ecosystem for entrepreneurial activity.